A few months ago a rep from Marcal Small Steps contacted me to see if I’d be interested in looking at their recycled paper products. I’ve tried to cut down on my use of paper products over the past year (using cloth napkins and old-shirts for cleaning instead of paper towels), but I was definitely interested in taking a look. The company sent me everything in their eco-friendly Small Steps line: paper towels, facial tissue, toilet tissue, dinner napkins, and everyday napkins. And, I have to say I was pretty impressed, not only with how green the company is, but how well their recycled products held up. What I love about this company is that all their products are made from paper, not trees. The company has been in business since 1950, and they estimate that they’ve saved over 20 million trees to date with their eco-friendly paper products. They were making recycled paper products when green was still just a color, not a movement. They not only use recycled paper to make their products, but they also skip the chlorine bleach, which is incredibly harmful to the environment. And, they reuse over 200,000 tons of paper each year to make their products. So, they’re definitely an ethical, eco-friendly company. But how do their products stand up? I only use paper towels for the really dirty jobs. I won’t go into detail, but I have two dogs so I’ll let you use your imagination. How did the Small Steps paper towels handle the tough stuff? Well, I was pretty impressed. I can’t say they were as tough as Bounty (you’d have to drag those paper towels behind your car to get them to shred), but then again, Bounty uses god-only-knows how many trees to make their towels. Given the choice, I’d buy Marcal every time. They held up pretty well on the big messes, great on the small ones, and I can use them without feeling bad that a tree had to die just so I could have a paper towel. I was really happy with the toilet paper. It was just as good as the Green Forest I’d been using. Is it super-fluffy-soft? No. I haven’t found any recycled toilet paper that is, simply because that super-fluffy-soft feeling comes from wood pulp found in very young trees. Besides, how fluffy does it really need to be? It’s toilet paper, after all. The toilet paper was thin, but not paper thin (like the CVS Recycled Toilet Paper I just got to try). Would I buy it in the store? Definitely. Thanks to my fall allergies I used every single tissue in this box. For extended use (as in, blowing my nose at least 25 times per day) I have to say that my nose got kind of shredded. But if you were going to use them like a normal person, these tissues would work great. Marcal sent me two types of napkins to try: dinner napkins and everyday napkins. The dinner napkins were really nice. They’re the kind that you’d want to use if you were having a nice dinner party. They were thick and soft, and you couldn’t tell at all they were made from recycled paper. The everyday napkins were great. They were just regular folded napkins and, just like the fancier dinner napkins, you’d never guess they were made from recycled paper. Although I’ve really tried to limit my use of paper products over the past year, I was really impressed with these products. They’re just as good as the other recycled paper products I’ve tested (like Seventh Generation and Green Forest), and better than some. The good news is that Kroger carries Marcal products, which means that if I can buy them right up the road in my little town, chances are you can find them fairly close to you. I use the toilet paper for guests ( for myself I use cloth) and it is cheaper and softer than sevength generation. I don’t buy napkins or paper towels, but if I even do I will try there brand as well. Marcal is one of the biggest polluters in the history of NJ. To sell under a green banner is a joke. 2) Stop shipping product made in NJ, across the US. That would make a much bigger environmental impact. 3) Clean the river next to their plant, that they have polluted for 50 years and destroyed. Why not clean that up, with their illicit, false green claims to make profits? You can’t walk away from your past. Even though they are trying. Try and really be green, not pretend to be green. And a good PR campaign can win many awards. But facts, when properly examined, speak for themselves. 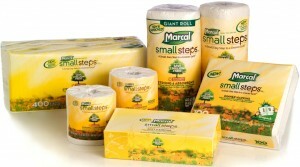 If you think Marcal is eco-friendly, you have not done your homework. I’d rather pick my nose and wipe it on the ground than to use their sand paper rough product. In fact, I’d rather blow my nose on a tree than their tissue. At least then I would be saving a tree rather than killing it to make a tissue and save on my nose compared to their tissue. AND THEY NEED TO STOP DUMPING INTO THE LAKE!! !